At the end the target of this "Analytical puzzle" is to produce optimal structure for player's selection which will help team to grow up step by step and to reduce values for player's transfers into the squad. Will help to achieve victory! The main index which directly influence on the result of match is "Expected Win Rate". According to the amount of produced Big Chances (obvious possibility to score) and Small Chances (potential possibility to score), also to their correlation with build-up (promotion of the ball to active positions) and to team's player rates, we can decide who would probably win the match. IMPORTANT: if we would have an accept to watch match in live mode we can do the report during the game and give advices for coaching staff how to change the game structure to win the match. Lets choose for players optimal roles! 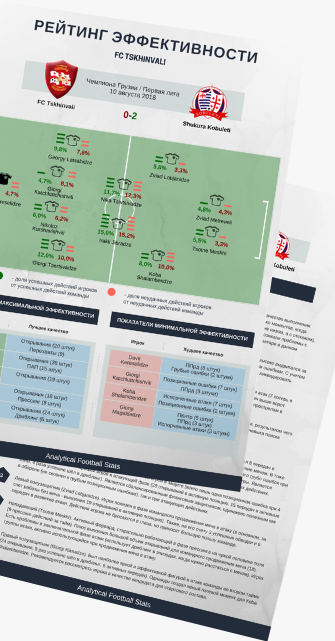 In this methodology we evaluate efficiency of player's actions in the match according to 3 main phases of game: defensive skills, ball promotion and actions at final third. Each phase divides on components and, as a result, we get a correlation of player's successful and failed actions with team's index. Optimal game structure is when you have no players who did more failed actions than successful. 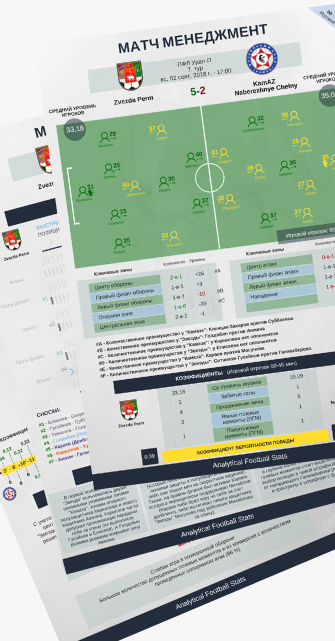 When we are making scouting profile, we are tegging each game episode and giving them our mark according to the skills of the player. So you can always make a request about any episode and we will necessarily give you information about it. 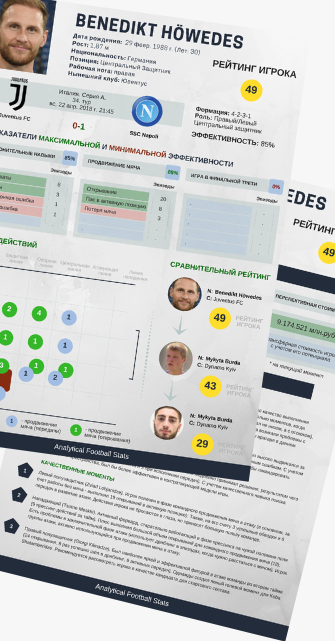 If we have a period of matches for analysis, we can count player's rate according to world rate of players, and also can predict his potential level as to give recommendations about the most efficient way to integrate the player into team's game structure. 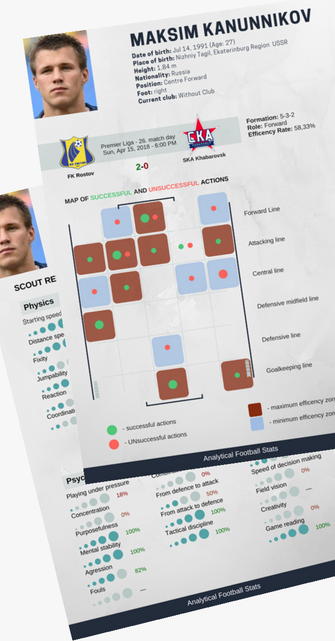 In this methodology we evaluate directly efficiency of player's actions during the game. And according to this information we can say whether the player could give team new quality or not. So at this stage we can cross out those players who would not satisfy team's level or have another stylistical profile. It will save time of club's selection staff!